Light the grill or heat the broiler. Put the tomatoes in a blender or food processor and add 4 tablespoons of the oil, the lemon juice, cumin, paprika, oregano, ginger, 3/4 teaspoon of the salt, 1/8 teaspoon of the pepper, and the parsley. Blend just until the mixture becomes a coarse puree. Coat the swordfish with the remaining 1 tablespoon oil and sprinkle with the remaining 1/4 teaspoon salt and 1/8 teaspoon pepper. Grill or broil the fish for 4 minutes. Turn and cook until golden brown and just done, about 4 minutes longer. Serve the sauce alongside. 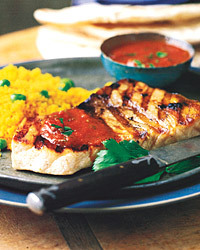 Fish Alternatives Cod, halibut, tilefish, mahimahi, mako shark, sturgeon, tuna—just about any fish steaks can stand in for the swordfish. Choose a Pinot Blanc from Alsace in France or a Pinot Gris from Oregon; both are delightful, easy-drinking white wines that will have enough body and the requisite moderate acidity to pair with the spicy tomato sauce.